Her conception of God was certainly not orthodox. She felt towards Him as she might have felt towards a glorified sanitary engineer; and in some of her speculations she seems hardly to distinguish between the Deity and the Drains. When Newman was a child he "wished that he could believe the Arabian Nights were true." When he came to be a man, his wish seems to have been granted. But there is more to Lytton Strachey than to Maurois and Montanelli. His humor is almost never entirely magnanimous. His irreverence is not intended to make history "friendlier" to the readers, but to expose it in its pretensions and its petty truth. He is a man with an axe to grind. The 19th century is both his subject and his adversary. The only way to present it truthfully is to break with its canons. That is why he doesn't write a history, but a series of "silhouettes." That is why he denounces traditional biographies in the Preface and focuses instead on the psychology of the people he writes about, on reconstructing their personalities and, through this lens, their deeds. And once he does this, a different picture of the 19th century emerges. The people Strachey presents are, in his own words, "an ecclesiastic, an educational authority, a woman of action, and a man of adventure." All four of them were esteemed in the Victorian society. Only one of them deserved this honor. (Hint: It's Florence Nightingale, duh!) All four of them tell us something about the 19th century. A handful of threads run through all of the stories: a certain ironical distance from the characters' devout Christianity, a sympathetic mocking of bureaucracy, an understanding of the seductive force a powerful personality can have, and a good dose of cosmopolitanism. Between them, these characters have traveled the world, or at least the parts of the world Britain had stamped as her own, plus dear old continental Europe. Since every section has its different tone, I will try to give a short presentation of each. So, who are our eminent Victorians? Cardinal Manning was a man in whom "the Middle Ages lived again," a cleric with the face of an ascetic and a talent for intrigue and administrative maneuver. The section dedicated to him is the most accomplished of the book. It depicts the religious unrest in the Church of England in the 1830s, the dubious machinations of the ecclesiastics, the Oxford Movement, and the high intrigue of the Vatican. Strachey's sharp humor is at its best here. As he says, "Je n'impose rien; je ne propose rien: j'expose." But his exposing makes it quite impossible to admire either Manning or the Churches anymore. Florence Nightingale is a woman of frightening energy. Her contribution in the Crimean War, the way she managed to reform the hospital of Scutari, though bureaucracy was uninterested or downright hostile to her efforts (the principal medical officer of the army even tried to starve her and her nurses out) is impressive and Strachey doesn't try to mock it. What he objects to is Nightingale's almost manic determination and her tendency to dominate men and enlist them to further her noble causes. All in all, not terribly objectionable behavior, and this section reads more in Nightingale's favor. Out of all the people depicted in this book, she was the only who did something quantifiably good for the world. Dr. Thomas Arnold was a hateful bigot and Strachey is well aware of it. Arnold didn't believe in the separation of the church and state, and thought schools should impart to children not actual knowledge, but how to be good Christians. He wasn't adverse to enlisting corporal punishment to this purpose either. And this was the man they put in charge of reforming the school system. Strachey is scathing in exposing Arnold's narrow-mindednes. General Gordon was a guy with a very exciting life. This was my least favorite section, but Strachey did a decent job with depicting Gordon's time in China and Egypt and Sudan. His depiction of the Islamic religious revolt in Sudan was just as insightful as his earlier discussions of Christianity. The members of the English Church had ingenuously imagined up to that moment that it was possible to contain in a frame of words the subtle essence of their complicated doctrinal system, involving the mysteries of the Eternal and the Infinite on the one hand, and the elaborate adjustments of temporal government on the other. They did not understand that verbal definitions in such a case will only perform their functions so long as there is no dispute about the matters which they are intended to define: that is to say, so long as there is no need for them. [...] they lost their faith. With this difference, however, that while in Froude's case the loss of his faith turned out to be rather like the loss of a heavy portmanteau, which one afterwards discovers to have been full of old rags and brickbats, Clough was made so uneasy by the loss of his that he went on looking for it everywhere as long as he lived; but somehow he never could find it. When Manning joined the Church of Rome he acted under the combined impulse of the two dominating forces in his nature. His preoccupation with the supernatural might, alone, have been satisfied within the fold of the Anglican communion; and so might his preoccupation with himself: the one might have found vent in the elaborations of High Church ritual, and the other in the activities of a bishopric. But the two together could not be quieted so easily. The Church of England is a commodious institution; she is very anxious to please; but, somehow or other, she has never managed to supply a happy home to superstitious egotists. In case you couldn't tell, I loved this book. I am deeply grateful to have stumbled across it. It's given me hours of entertainment and a lot of things to think about and research further. Not just about the 19th century, but about the period Strachey wrote in and about his intellectual background (like his friendship with Virginia Woolf or his connection to the anti-Hegelian circles at Cambridge). I can only give it 5 out of 5 stars and heartily recommend it. I just put this on hold at the library! I'd heard how funny and irreverent it was. I hope I enjoy it as much as you did. I think I am going to have to look into this book. I have never heard of it until now. Thanks for sharing! I just ordered the free Kindle edition. Thank you for the recommendation! 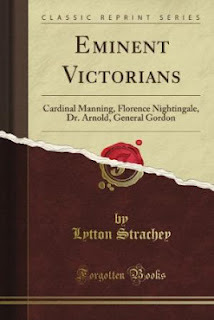 I am most interested in the section on Florence Nightingale (go figure). When reading her writings, I am struck that her observations are as relevant to the high-tech health care environment (rife with hospital-acqured infections and resistant organisms) as they were during the Crimean War. She was truly inspired! I loved your highlighted reference to her concept of God as a sanitary engineer! Florence Nightingale was seriously awesome. I didn't know so much about her before reading this, but her section really impressed me. It seems some of her measures (like maintaining good ventilation) worked more because of luck (she didn't believe in germ theory), but she still did good work. Also, it's interesting how Strachey is very aware that she was able to do this because she had access to the high society. He notes how a middle-class woman wouldn't have had enough influence.